This party is one of those that you will love to the moon and back. Guess How Much I Love You is a timeless story by Sam McBratney, and beautifully illustrated by Anita Jeram. This best-selling book has captured the hearts of children all over the world, including our celebrant, Owen. In fact, according to Mommy Joanne, Owen is very fond of the characters from the book. This is what inspired her to use this as a theme for baby Owen’s baptismal. 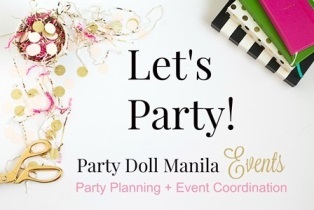 Event stylist, Dentelle Manila, did a great job bringing this story to life with the elements they put together. Green and brown are the main colors used to brighten-up this affair. They brought that “walk-in-the-park” feel to the whole set-up. Lines from the book and drawings of Big Nutbrown Hare and Little Nutbrown Hare were also meshed to the design to make the guests feel familiar to the story. Not a very ordinary theme indeed but was made relatable by the amazing style team. Can you guess how much we love to see the stills of this soiree!? This much! *arms stretched from side to side* Thanks to our incredible friends from Delightful Little Darlings for capturing precious moments from the event, there’s no need for us to jump up to the moon and back to find out how awesome it turned out! Main elements from the story made this stage set-up one for the books! One of the pages of the book was recreated and blown up to be used as a backdrop, now that looks like a giant story book. On one side of the stage, you will find a tiny backyard with a wooden cabbage patch (and with real cabbage!) There’s also a standee of Little Nutbrown Hare, who is one of the main characters of the story. On another side of the stage, a brown frame and a white fence were placed in front of the backdrop, where you can spot trees and what seems to be the outdoors of the characters’ home. The center of the stage is the dessert spread with all sorts of yummy goodies. The long table was embellished with cute tiny carrot buntings and banners designed with story lines and illustrations from the book. White tassels tied on a leaf crown are the overhead ornaments used. A simple yet elegant way to embellish the ceiling that will not steal the show from the main décor. The table centerpiece added a fresh and charming feel to the celebration. It was set-up as neat as a button, with a few elements incorporated from the story. There’s a cute standee of Big Nutbrown Hare and Little Nutbrown Hare. A frame with lines from the story. There’s also a tiny carrot, fresh flowers and a kite. All nicely placed at the center of the table for everyone to enjoy looking at. This dessert spread is nothing less than mouth-watering. Lovelots Desserts made sure guests feel the love from the sweet treats of this sweet affair. And of course, these goodies also have a piece of the theme added to them. There’s carrot sugar cookies; bunny hole sugar cookies; sugar cookies designed with theme logo; kite and cloud cupcakes. The actual graphic illustration from the book were used as cupcake toppers. Not only were these treats luscious to the taste, they’re so enticing to look at! Now isn’t that brilliant! Here’s our little celebrant, Owen, with his lovely parents. Owen’s family is based in the US, but Owen’s Mommy Joanne was hands-on in finalizing the party details, coordinating only online.